The Cypher maintains a relatively straight tail section, with the overall tail width being reduced when compared to previous versions. This helps to bury the tail for more powerful turns. 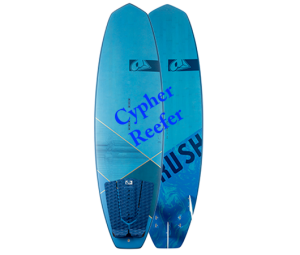 The Cypher has a straighter hip to stabilize the board in higher wind and with higher speed bottom turns. This helps to maintain the versatility in both onshore and sideshore conditions. The Cypher features a full nose with a lot of area relative to its size. The rider can move forward on the board for lighter winds and planning, stepping back for more aggressive riding. 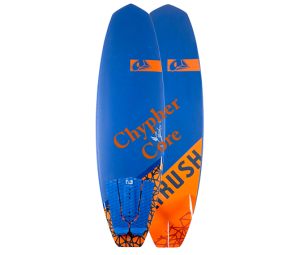 The width of the Cypher is the key to its light-wind, small wave and onshore performance. The tail pulls in quite significantly for its width, which help with more powerful top turns than traditional short / parallel outline boards.